Seeking Amish furniture in Kansas? America’s best-known Plain People have a long history in the Sunflower State, dating to the 1800s. Thriving workshops are found in a number of Kansas’s Amish communities, in particular near Yoder and Hutchinson in Reno County and Garnett in Anderson County. Whether you live in Kansas City, Topeka, Wichita, or elsewhere in Kansas, you’ll find Amish home decor sellers within a reasonable drive in our listings below. Amish and Mennonite-crafted furniture in hardwoods including cherry, hickory, northern red oak, quarter sawn white oak. Drying racks, bedroom suites, living room furniture, dining tables, china cabinets, filing cabinets, hutches, computer desks, wedge desks, rolltop desks, more. Furniture crafted in Mission and other classic styles. Kansas Amish furniture retailer providing furniture crafted by 30 Amish woodworkers in Ohio. Hardwood production including cherry and maple. Amish-made bedroom, office, living room, children’s furniture pieces, including desks, bookcases, office chairs, file cabinets, dressers, beds, hope chests, mirrors, benches, cribs, rocking chairs, tables, gliders, recliners, and more. Five-year old Amish furniture business started by Vernon and Miriam Stoltzfoos of Pennsylvania. Solid woods include elm, hickory, maple, walnut, cherry, oak, quarter-sawn white oak. Furniture produced by both Amish and Mennonite craftsmen in aproximately 50 woodworking shops. Cabinets including wine cabinets, pie and jelly cabinets, curio cabinets. Occasional tables, chairs, and a wide range of furniture pieces for the office, bedroom, living room, and children’s room. Also selling Amish poly outdoor furniture including picnic tables, folding chairs, rockers and gliders, in 7 color varieties. Kansas City-area dealer of the Simply Amish line of Amish-made furniture. Newly-opened ( Nov. 2011) Topeka branch of the Simply Amish furniture franchise. If you’d like to search for Amish furniture dealers in other states, try the Amish Furniture Guide main listings page, featuring a full directory of Amish furniture sellers in the US and Canada. Note to Kansas residents: Please be sure to check opening hours of any Amish furniture businesses listed in this guide before traveling long distances to visit them. While we strive to keep this directory up-to-date, business locations and availability can change. Not responsible for changes to information. Amish history in Kansas dates to the mid-1800s; the commercial woodworking tradition is much younger. Amish have relied on agriculture as a way of making a living since their time in Europe. Furniture making, along with other businesses, has more recently emerged as a popular alternative occupation for Amish. With less capital investment required–and a consumer furniture market willing to spend on quality work–furniture craftsmanship has attracted numerous Amish over the past few decades. Though Kansas Amish don’t face quite the same land pressures as their Eastern cousins, entrepreneurship has flourished in the prairie state. Amish and furniture making are in some ways a natural match. As Amish finish school at the 8th grade, they tend to be oriented towards manual trades, picked up on the farm or learned from relatives and neighbors in an apprenticeship format. Amish children go to work at age 14 or 15, often first at home, but eventually in outside businesses in the community as well. Amish furniture shops are one place where adolescent Amish boys hone their craft. By the time he opens his own furniture business, an Amish male may have a decade of experience, well before the age of 30. Amish furniture is often advertised as “heirloom quality“, “future heirlooms“, “instant heirlooms“, and given other such monikers. This suggests a high level of craftsmanship and quality work, which is often the case. Amish are taught to avoid pride–but regardless the Amish furniture craftsman takes deep satisfaction in work well done. Doing a good job for others comes naturally, which is one reason Amish furniture manufacturers enjoy trust and a good reputation as a whole. To satisfy their customers, Amish have expanded beyond the traditional furniture styles that one might find in an Amish-owned home. 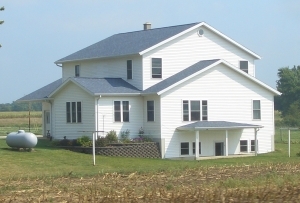 Though Amish do create Mission, Queen Anne, Craftsman, Shaker, and other classic styles, they are typically eager and able to make a wide range of more contemporary designs. Custom Amish craftsmen create such pieces to order for customers from urban and suburban locales; other Amish furniture businesses stock full lines of diverse styles of furniture. When it comes to customizing a furniture piece, woods and stains offer a lot of flexibility. Hardwoods are preferred by Amish; oak, maple, walnut, cherry, quarter-sawn oak, and numerous others can be found in the Amish furniture repertoire. Amish finishing shops do the painstaking work of carefully applying a layer of finish to the piece, which can be one of many varieties. Amish furniture is sold in a variety of venues across Kansas. First, those furniture seekers who’d like a direct experience are able to visit and order Amish furniture direct through Amish-owned shops. Kansas Amish communities such as the Yoder/Haven settlement and the Hutchinson Amish settlement (both in Reno County, KS, about a 45-minute drive from Wichita), as well as the Garnett community in Anderson County (about 1.5 hours by car from either Topeka or Kansas City) are places where Amish furniture craftsmen can be found. There are also a number of smaller settlements across Kansas, including in Labette County and Marshall County. Retail Amish furniture showrooms, typically owned by non-Amish, also carry a wide range of Amish furniture. Amish furniture retailers are found in a number of locations across Kansas. Kansas residents can also order Amish furniture online through numerous web sellers. Do any of the Kansas Amish Furniture craftsman make fireplaces? If so where and what would be the best way to contact them? Thanks in advance of your answer, it is very much appreciated. Yes, Forever Oak in Salina, Kansas has a beautiful line of solid hardwood electric fireplaces handcrafted by the Amish. They are available in solid oak, cherry or quartersawn oak in over 20 stain choices. Where can I find a furniture maker in Labette county KS? Looking for shelf with pegs to hang coffee cups on. Shelves with pegs are available for order at Forever Oak in sizes ranging from 12″ to 72″ long and shelf depths of 5″ or 7″. Available in Solid Oak, Cherry or Maple in 20 stain choices. Randall- At Forever Oak we have hundreds of bedroom styles, including contemporary, to choose from in 100% solid hardwoods. Solid oak, cherry, maple, ash, elm and hickory are the most common that we have available, with over 20 stain colors to choose from. All of our furniture is carefully constructed by Amish craftsmen using methods such as hand-planing and dovetailing of drawers. Our website is currently being re-constructed, so there are just a few examples to view there, but we also invite you to visit our store in Salina, Kansas to see the quality of our furniture in person. We can show you the full line of bedroom furnishings that we have available to create the look you are searching for. Anyone in Wichita, or Yoder area who might have wheels?